18 August 2018 - seven weeks old! Visitors for the truly beautiful and contented babies: one son and the daughter are offered a home. ​One little boy is still looking for his forever, kind and understanding "parent(s)". 11 August 2018 - six weeks old! 4 August 2018 - five weeks old! 28 July 2018 - four weeks old! ​21 July 2018 - three weeks old! three weeks ago a very stressed Cat went into labour unprepared and homeless. Today a beautiful young mother manages her family with skill and determination despite the heat and in limited space . The kittens continue to grow and develop. Neatly aligned they now drink in equal rhythm and harmony. When this happens the mother picks up this rhythm, turning her four paws outwards and inwards in ecstasy. Her eyes then are no longer widened, but blissfully slit. Happy moments of motherhood in the safety of a cage. 14 July 2018 - two weeks old! The kittens have their eyes open and access to a whole big new world. They start moving about much more determinedly and systematically explore their basket. How soon will they drop themselves over its rim into the unknown of their cage? Their surroundings are also taking note of them. The ginger and white Cat is showing an interest and will later gently tap a kitten head with her paw. Mummy still hisses impressively when stressed, but keeps herself and her family clean and beautiful. She has been slowblinking carers!!!! 7 July 2018 - one week old! So far they made it! The young Mummy has not succumbed to fear and very obvious stress. She tries to protect her family by frequent hissing, but accepts food and litter cleaning services. Though still panic stricken, - look at her wide eyes, - she continues to feed her three babies. 30 June 2018 - birthday! Cospicua , Saturday morning, 30 June . A sleek tabby cat starts birthing in the busy streets. What do you do? Leave her to it? Look away? Stand and stare? Fortunately for the Cat responsible and kind people noticed and acted. Quick thinking and organized a cat box was produced and put next to the young mother. Fortunately the Cat in labour was intelligent and desperate enough to go in. The box was closed and taken to the Sanctuary where the Cat gave birth in a cage in a comparatively more comfortable, cool and quiet environment. 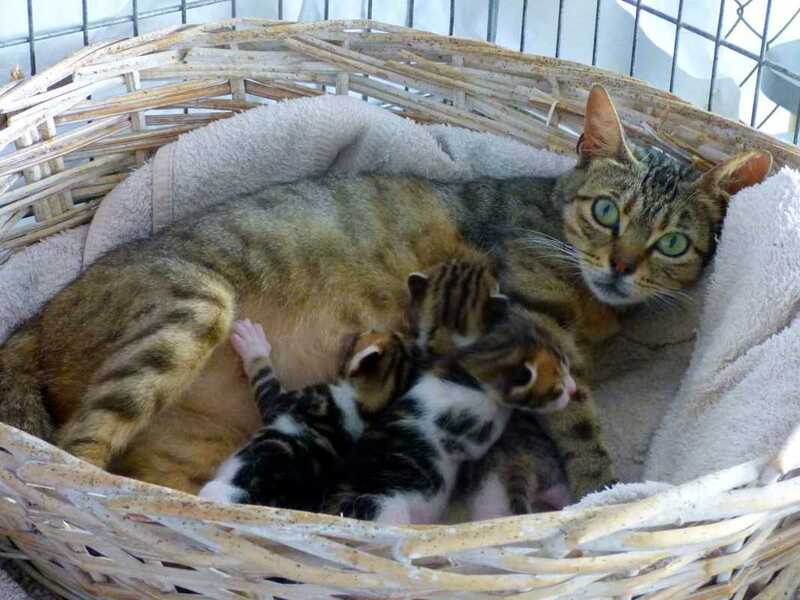 Her blind, tiny, tabby babies are presently the youngest Sanctuary babies. The mother is hugely stressed, but is feeding her kittens. 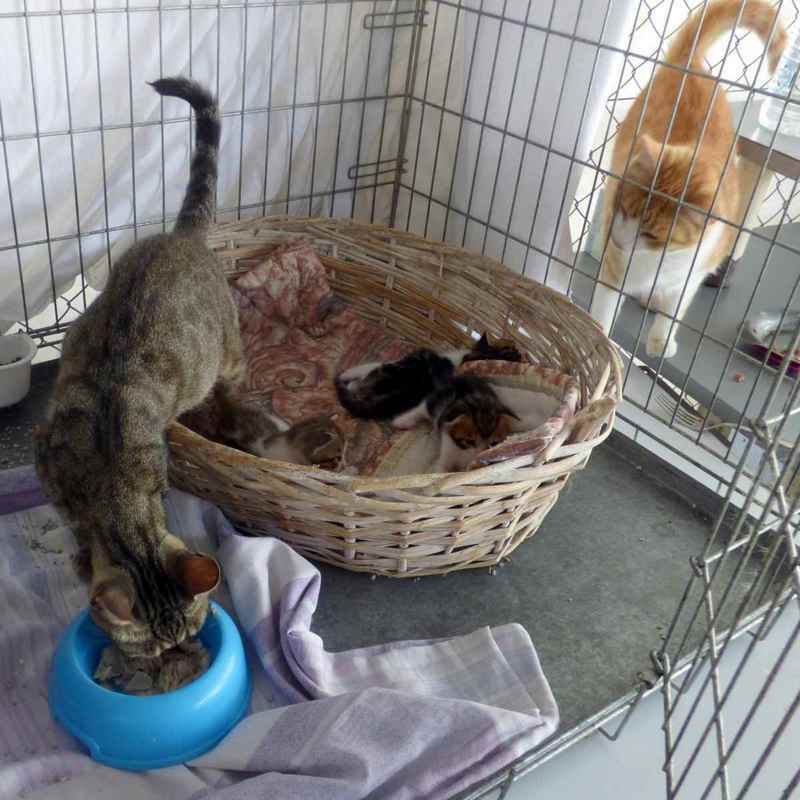 We all hope she will accept her confinement and continue to look after the three Cospicua Kittens.